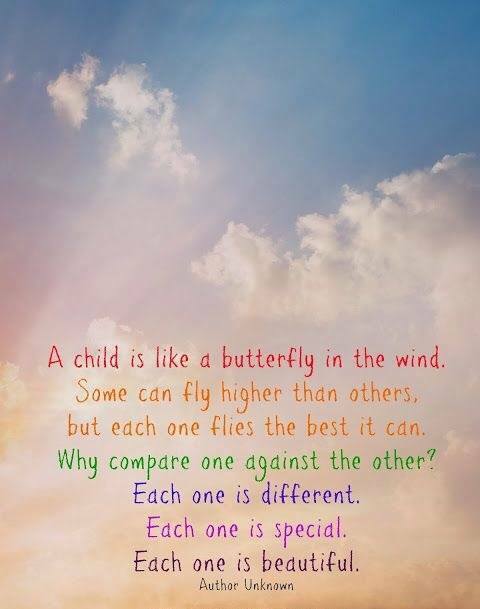 A CHILD IS LIKE A BUTTERFLY IN THE WIND. SOME CAN FLY HIGHER - ProudMummy.com the Web's Community for Mums. A CHILD IS LIKE A BUTTERFLY IN THE WIND. SOME CAN FLY HIGHER THAN OTHERS, BUT EACH ONE FILES THE BEST IT CAN. WHY COMPARE ONE AGAINST THE OTHER? EACH ONE IS DIFFERENT. EACH ONE IS SPECIAL. EACH ONE IS BEAUTIFUL. So true, until they start school and they want them to fall into line. Definitely no point comparing...good they are all different as be boring otherwise!! !